Universal Energy Scanner also known as the aura scanner, is a device that can sense the aura of a person or object. Each living or non-living being on the planet is made up of matter, of which an atom is the smallest part. The universe comprises of various energies emanated and affected by the atom. The scanner has been devised to effectively sense the levels of energy sample provided to it. So where is the science involved? How can the Energy scanner help you? The whole universe is compiled of various energies. All living and non- living objects have some or the other form of energy. We humans are no exception. Our body is comprised of various energies which creates an ‘aura’ around us. 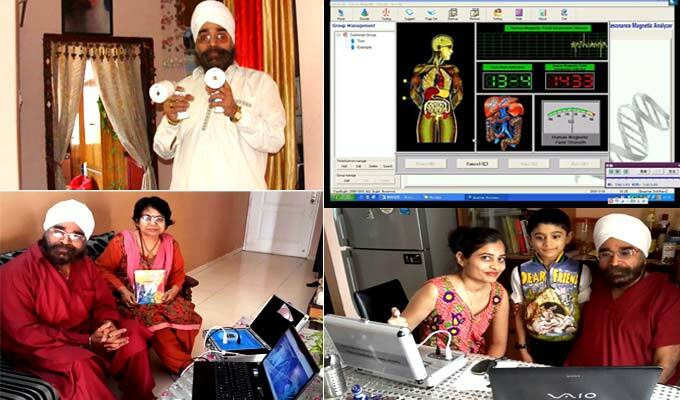 Energy scanner is the device used to measure these energies and to identify the harmful ones out of these.This device is an amazing invention by an Indian Scientist based on scientific principles. If the scanner us used properly it can be used to: Each person has an aura. If a person is unhealthy or is wearing some negative jewellary / gems, his aura gets affected. he should take. Our body and environment is made up of a balance of all seven colours. When an imbalance is observed, it indicates a disease or some problem in the location. This scanner can detect what amount of colour is needed in the house or the body. This is what is called the colour therapy, which when taken alongside medicines, heals faster . 4.Vaastu dosha / Feng Shui: Most Vaastu consultants are work on the structural principles only. This is why even after living in perfect vaastu compatible buildings, one keeps on experiencing problems in the life. There could be negative energy points in the vicinity that cannot be detected without this scanner. There are energies within clothes, utensils and other articles which feed on the aura of the house and the humans living in it, bringing ill luck. 5.Geopathic Stress.. Geopathic stress is the term given to continually emitted gases and energies by the Earth. These cannot be seen with a naked eye. Too much of such negative energies do not let an individual grow in personal and professional lives. There have been cases where individuals suffered from Cancer and TB at a very young age. They were living in stress zones. 6.Position of Chakras :If all the chakras are not functioning properly, there could be a problem in the energy levels. There are blocks which hinder the flow of energy which gets disease or problem in the temperament. With the help of the Energy Scanner, we can find out the exact position of the Chakras. 7.Medicine Compatibility: Sometimes medicines just don’t help, no matter whether it is allopathic, homeopathic or ayurvedic. You have to go through the hit and trial to see which one suits. This is because certain medicines may not be compatible with your body. With the scanner, you could find out which medicines will work better for you. 8.Find negativity in a body:, Most diseases and stress are caused mainly by negative energies of the body. Using this scanner one may find out the negativity of the body and identify if any ill effects are there because of the negative energies. 10.Identify gems that suit a person:. It is possible that you have been suggested multiple gems by the astrologer. However, they all may not be compatible with each other or to find out which one would suit you, the services of the scanner may be utilized. An aura is a field of electromagnetic energy that emerges from all living things. In Eastern religious traditions, such as Hinduism and Buddhism, it is thought to flow directly from the chakras, and is expressed as a multi-colored body of light that surrounds a human being. In Western religious traditions, you can often see depictions of the aura in religious art — such as a “halo” surrounding the heads of Deity, saints, or other holy figures. The colors exhibited in an aura have specific meanings. As a result, when you know what your aura looks like and what it says about you, you gain profound insight into your true inner state. Though auras are generally reflective of your core nature, they can fluctuate and change based on everything from external pressures and circumstances to your current level of physical wellness and emotional and spiritual state. Aura machines are particularly useful for helping you document and observe these fluctuations over time. In quantum medical area, the fundamental reason for people suffering disease is that the spinning and the orbiting of the electron have changed, which makes the atoms change, which causes the biological micro molecule change. Therefore, the biological macromolecule changes, gradually, the whole cell starts to change, and ultimately the whole organ change. Since the electron is a charged body, when the spinning and the orbiting of it have changed, the electromagnetic waves inside will change accordingly. The energy of electromagnetic wave variation, which is caused by the different states of dieses and nutrition, is very weak, usually only Ns Gaussian or To Micro-Gauss. The frequency and the energy of the magnetic field are measured by holding the sensor with hand. It is similar to the theory of listening to the radio. There are various wireless waves in the air, but if you want to listen to certain broadcasting station, you should modulate the radio to the same frequency, which causes the resonance, and then, the radio can get the specific radio station. Quantum Resonance is based on this theory as well. checking 36 test within 10 mintes by new aura scanner.